Putin Blames "Ukrainians Or Jews" For Election Meddling: "Maybe The US Paid Them"
A week after initial excerpts of Megan Kelly's interview Russian President Vladimir Putin were released, the Russian presidential office published the full transcript of the full interview on its website on Saturday morning, specifying the conversation took place in two seatings, in the Kremlin on March 1 and in Kaliningrad on March 2. As we noted last week from the initial excerpts, despite Mueller's 37-page indictment, Putin said he has seen no evidence thus far that the alleged meddling broke any laws. In the most aggressive and controversial section of the entire, often-combative, 90-minute interview with NBC television, Putin suggested that we do not know if these people were Russians, that "they may have been Ukrainians, Tatars or Jews", and that the whole operations may have been a false flag: "maybe, the US paid them for this." "So what if they're Russians?" Putin said of the allegations. "No, this is not true. If they violated Russian law, we will prosecute them. If they did not, there is nothing to prosecute them for in Russia. But after all, you must understand that people in Russia do not live under US law but under Russian law. This is how it is. If you want to reach an agreement with us, let us negotiate, choose the subject, make an agreement and sign it. But you refuse to do this. " "I am telling you for the third time: we have proposed working together on cyberspace issues. But the US refuses to work like this and instead throws 13 Russians to the media." 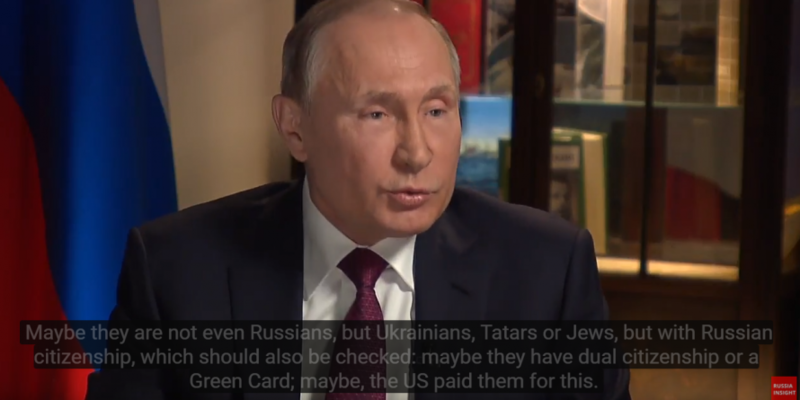 "Maybe they are not even Russians, but Ukrainians, Tatars or Jews, but with Russian citizenship, which should also be checked: maybe they have dual citizenship or a Green Card; maybe, the US paid them for this. How can you know that? I do not know either. " And, third, we have repeatedly suggested that the United States and Russia establish relations in this area and sign a corresponding interstate treaty on extraditing criminals. The United States has evaded this proposal and does not want to sign it with Russia. What are you hoping for? That we will extradite people to you whereas you will not? This is not a proper way to go about international affairs. Putin claimed that the United States interferes in Russian elections "all the time" but that it was "impossible for us" to do the same. "First, we have principles whereby we do not allow others to interfere in our domestic affairs and do not get into the affairs of others....Secondly, we don't have this quantity of tools," he said.